New Kia Stonic 2019 – another player in the class B-SUV | cars news, reviews, spy shots, photos, and videos. Company Kia introduced a new subcompact crossover Kia Stonic 2019-2020 model year. Data on the car was declassified a week after the official presentation of a related Hyundai Kona , with which the novelty is very close in technical terms. In Europe, sales of the new Kia model will start in the autumn of this year after the show at the Frankfurt Motor Show. The base price of the crossover will be about 17 thousand euros. In the Russian market, Kia Stonik 2019-2020, like Kona, will not be presented, although the appearance of both cars would certainly arouse great interest among the audience, gravitating towards small SUVs. While attention of such kind of motorists is turned towards other “Koreans” – this is, first of all, Hyundai Creta and to a lesser extent Kia Soul . Despite the fact that the novelty of Kia is unlikely to be seen personally, nothing prevents to get acquainted with it virtually, since all information, including photos, bundles and characteristics, is presented on the web. And there, you will see, and in the office of the Korean company they will reconsider their policy and bring the SUV to Russia. The close technical relationship of Stonik to Kona determined the similarity of the dimensions and proportions of the two models. True, the crossover from Kia nevertheless turned out a little more compact: length – 4140 mm, width – 1760 mm, height – 1520 mm. The wheelbase is 2580 mm. Externally, the serial version of Kia Stonic was much more modest and restrained version, shown on sketches in early June. This did not prevent the crossover from retaining a stylish and modern look with impressive body shapes and a host of newfangled solutions. From the front, the car is recognized thanks to the proprietary “nose tiger” grille, beautiful headlights, a bonnet with relief ribs, a developed bumper with a large air intake trapezoid and two vertical niches with point fog lights on the sides. In the back, we note the presence of bright lanterns, a boot lid of the original form and a sports diffuser with a single exhaust pipe on the right. When looking at the profile, we distinguish a dynamic silhouette, athletic body sides and powerful wings. Crossover all its appearance exudes energy, moving to active driving. Several cool this fervor off-road attributes, reminiscent of the belonging of the car to the class of all-roads. Protection from the impact of the gravel and crushed rock out of the wheel provides an impressive plastic body kit covering the entire lower perimeter of the body. 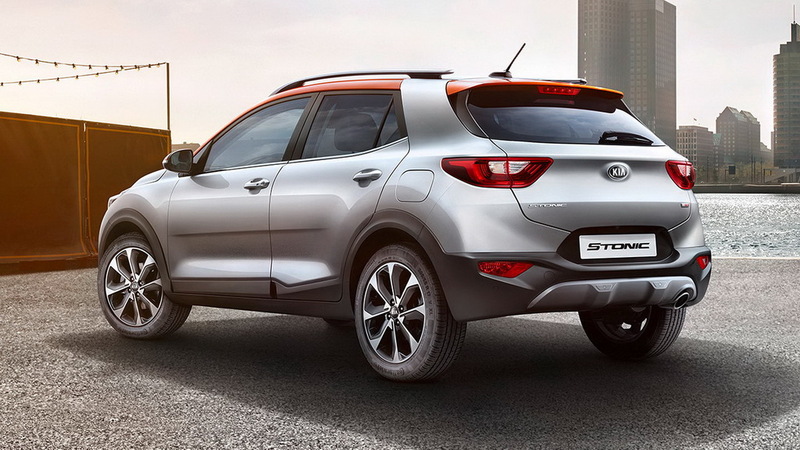 In accordance with the latest trends in the automotive fashion, the new Kia Stonic will offer plenty of opportunities for individualizing the exterior design. Prepared about 20 combinations of two-color design with five variants of the color of the contrasting roof. To this is added a wide range of light alloy wheels. The salon of the new Kia Stonik will be pleased with the good ergonomic component, decent electronic technical equipment and interesting design of the front panel with colored inserts made in the colors of the body paint (or in other colors if desired). Already in the “base” crossover is equipped with a multimedia system with support for Android Auto and Apple CarPlay, in expensive versions, offers a larger color screen (up to 8 inches) and built-in navigation. In the list of standard and optional equipment there are air conditioning or climate control, heated front seats, a rear-view camera, cruise control, keyless access. The driver will be assisted by emergency braking systems with recognition of pedestrians, monitoring of “blind” areas, warning of leaving the occupied band, automatic switching of headlights. The volume of the trunk Kia Stonic is far from the most record in the class. The standard layout with raised backs of the rear seats will fit in the cargo compartment up to 352 liters of load. More spacious compartment can boast Peugeot 2008 (360 liters), Citroen C3 Aircross and Opel Crossland X (both – 410 liters). The engines will be mated to a 6-speed manual or automatic gearbox. The drive is exclusively front. Suspension is built in accordance with the scheme with the front pillars of McPherson and the rear curling beam.